Misty Meadows Farm, Inc., located just outside of Charlotte, North Carolina, features over eighty acres of green pastures, manicured trails and pristine black rail fencing, and is also home to many four-legged creatures. But the heart of this property lies in the center of one family, who turned their big-time Saddlebred showing and breeding facility into a place of opportunity for children with special needs. 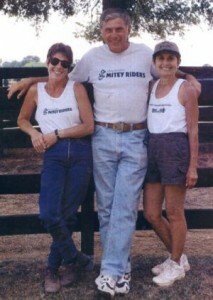 Harry and Marilyn Swimmer built Misty Meadows Farm from the ground up. They bred and trained champion show horses. They enjoyed the animals and the land with their growing family and friends. But over twenty years ago, their focus shifted. It was upon having friends over for dinner, including their young daughter Stacy, who has cerebral palsy affecting all of her movement and is hearing impaired, that the Swimmers acknowledged the power of the horse to change lives. Harry lifted Stacy onto one of his veteran horses, and her face lit up. Her energy changed, and in that, so did Harry’s. It was that same year, he and Marilyn decided to open up their property to children with special needs and thus, Misty Meadows Mitey Riders was born. Harry pursued therapeutic riding as a passion and a level of education. He became a PATH Intl. certified instructor, and alongside long-time family friend Joy Simon, they launched the program with a handful of horses and riders. Now,over 25 years later, Misty Meadows Farm hosts 75+ Mitey Riders each week and is home to 20 therapy horses, several PATH-certified instructors and over 200 volunteers. One of the aspects that sets Misty Meadows Mitey Riders apart from other therapeutic programs is the fact that all of the riders are able to participate weekly at no cost to their families. The Swimmers felt strongly that as long as the community could provide the resources to run the program no family should have to pay to ride. The riders who participate in the Mitey Riders program range in age from 5 to 18, and manage conditions such as cerebral palsy, muscular dystrophy, spina bifida, Down syndrome, post-brain tumor removal, autism, learning disabilities, and more. Many are in wheelchairs, or walk with assistance. But all have the opportunity to see the world at a different height, from the back of a horse. And so, every week, hundreds of individuals from property owner to business owner, high school student to veterinarian, parent to sibling gather to make the Mitey Riders program happen. The passion that the program creates is evident and the physical, cognitive, social, and emotional benefits that result for the riders are undeniable.